As a preferred base spirit for cocktails, Scotch whiskey historically ranks somewhere near dead last. Mixologists have found that the strong-flavored whiskeys of Scotland don't necessarily play well with other mixers. The new Lower East Side restaurant and bar Mary Queen of Scots refuses to accept that verdict. It's classic cocktails lists is headed with the few Scotch classics there are out there: Rob Roy, Scotch Old Fashioned, Robert Burns and Blood and Sand. Furthermore, the list also embraces another cocktail laggard: Brandy. Mary Queen of Scot will make its Sazeracs with Cognac and has a couple Brandy-based originals on the menu. "Jay Zimmerman and I collaborated on the cocktail list," wrote Marcine Franckowiak of Highlands, mentioning her The Breslin colleague. "For Mary Queen of Scots, I wanted to highlight the French influence and integrate it with the Scottish theme in the cocktail list. We chose to go very boozy for this particular list since we are in the Lower East Side, which has historically had a harder edge. We pride ourselves on a stellar Scotch list, but in addition to a dram you may also choose to indulge in an absinthe or Fernet as well." 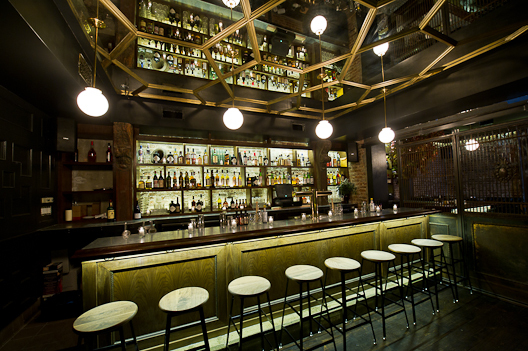 Joining Zimmerman and Franckowiak behind the bar are an impressive line-up of New York mixologists, including Jim Kearns (Rye House, the Standard, Freemans, Mayahuel), TJ Lynch (Spotted Pig, Rusty Knot, the Breslin), and Nate Dumas (Pegu Club, Clover Club).